UPDATE: Madison will get to visit with Mickey and Minnie after all. Following Team 10's story, a spokesperson from Disneyland said the park has offered to host Madison and her family with "park hopper" tickets. 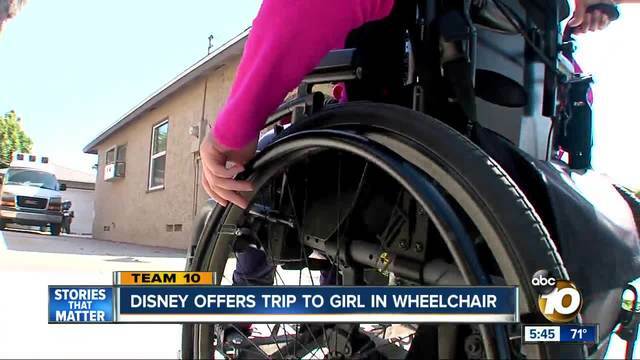 SAN DIEGO (KGTV) - Madison Wolanyk is just like every other 14-year-old, except she was born with cerebral palsy, spina bifida and autism. Madison has developmental delays and needs a wheelchair to get around, but she goes to school like everyone else and leads as normal a life as possible. Part of being a normal kid is going on field trips with classmates, but Madison didn't get to go to Disneyland with her special education class at Hilltop Middle School in February. Madison loves Disneyland, especially the Main Street Electrical Parade. Splash Mountain is her favorite ride, even though she gets wet. Her father, Eugene Wolanyk, didn't find out about the school trip until the morning the rest of Madison's classmates went. He learned about the Disneyland trip after Madison's school bus pulled up in front of their Chula Vista home for her daily ride to school. Madison wasn't taking the bus that morning because of a scheduled doctor's appointment. The bus driver was surprised, according to Wolanyk. "He said, 'Why? She's not going to Disneyland?'" Wolanyk recalled. "What trip to Disneyland?" Wolanyk called Hilltop Middle School and spoke to the vice principal. "He just told me very matter-of-factly there's like 100 students going so we couldn't get the lift for the bus, so that's why Madison's not going," Wolanyk said. Wolanyk was livid, especially after that same vice principal gave him an envelope with two complimentary tickets for Disneyland that expired that same day. It was too late to pack up the family van and drive two hours to Disneyland, so Wolanyk called the school's principal, who initially told him Madison said she didn't want to go. The principal promised to investigate. In the meantime, she urged Madison to write a letter describing the events that led up to her not going on the field trip. Watch Madison read her letter here . In the letter, Madison claims her adaptive PE coach asked her if she was going to Disneyland. She responded she didn't know. Later, he asked her to hand out permission slips. Madison picks up the story from there: "I'm handing out the permission slips, and I asked coach, 'Hey, coach, why is mine not in there? And he says you're not going. I'm not going because there's no ramp. And I'm like there's no ramp? And he's all there's no ramp." Madison never complained, even though she told Team 10 she was "very, very upset." Her father said that's her nature. "Madison is very easygoing," said Wolanyk. "She's always been really pleasant. It's never been like she's high maintenance or has to be sequestered and bundled and all kinds of behavioral outbursts of anything. This is her; she's very good." Wolanyk believed the school wasn't taking his complaint seriously, so he filed a claim with the Sweetwater Union High School District. 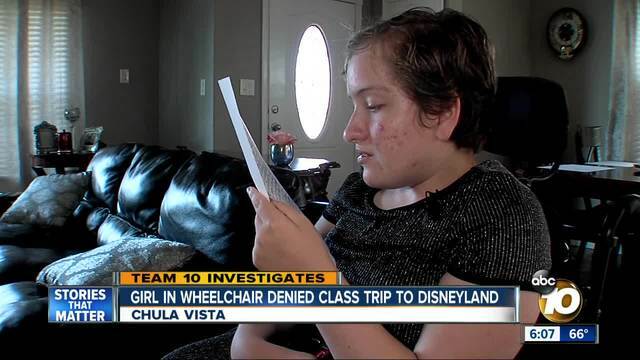 The claim states Madison also missed out on last year's special education trip to Disneyland for the same reason. The claim, which was promptly rejected by the district, says school personnel violated the Americans With Disabilities Act by failing to accommodate Madison. The alleged discrimination led to Madison's "emotional distress." Adding insult to injury, the claim states Madison's taxpayer-funded one-on-one aide was allowed to attend the Disneyland trip, while Madison was left behind. Wolanyk is a former Marine who went to nursing school so he could be a caretaker for his daughter. He is married to Madison's stepmother, who also has a special needs child. For Wolanyk, this is personal. He is furious that the district would fail to accommodate any special needs child. Wolanyk called the school's actions "cruel." "I want Madison to be given every opportunity that every other child has, especially since she's on a trajectory of attending high school until she's 22," Wolanyk explained. "So I asked them why do I always have to be holding the bag?" Wolanyk said he shouldn't always have to fight with the school for his daughter's legal rights. When the school year began, he said a school representative told him they were working out logistics and believed they would have a bus route for her within a week. "And I said she's [going to] miss a week of school because of logistics or whatever? I said I'm not [going to] be the bottom of the barrel. I want her picked up this morning on time," said Wolanyk. The bus, equipped with a wheelchair lift, was on time the very first day. The Sweetwater Union High School District has 110 buses in its fleet. Seventy-one of the buses are equipped with wheelchair lifts. Team 10 learned the school used a charter bus for the special education trip to Disneyland. The district has not supplied Team 10 with the name of the carrier, or whether the bus hired had a wheelchair lift. "Transportation of students with special needs is a high priority for the Sweetwater Union High School District and one that we take significant pride in. It is our practice to transport students to and from school-related events and to accommodate each student’s needs as appropriate. Currently, over 75 percent of our buses are equipped with wheelchair lifts. In addition, numerous routes are dedicated solely for transport of students with special needs and we have several staff members dedicated specifically to ensuring the timely, efficient and comfortable transport of students with special needs." SUHDS's transportation policy says: "If a disabled student is excluded from school bus transportation, the district shall provide alternative transportation at no cost to the student or parent/guardian ..."
Team 10 reached out to Margaret Dalton, Associate Dean of the University of San Diego Law School. Dalton, who specializes in special education and disability law, said there is no excuse for any school not providing adequate transportation to students who need special accommodations. Listen to Dalton discuss the situation here .